A shed is so much more than a place to tinker and store things in. It’s a place where men can retreat, share a beer with a mate and escape from the world. Justin Felix caught up with a photographer who captures the private relationship between a man and his shed. I’ve never met a professional photographer who wasn’t insanely passionate about their job and for that reason alone it’s a profession I’ve always admired. In fact, if my love for writing ever dissipated, I think photography would come and sweep me off my feet. The two art forms are similar in a lot of regards. They can each capture a moment or various moments in time and while they can both stand on their own two feet, they are so much more powerful when delivered in unison. Photographers are story tellers and just like writers they simply long for someone to listen. One such story teller is Craig Wetjen. The man behind the lens. 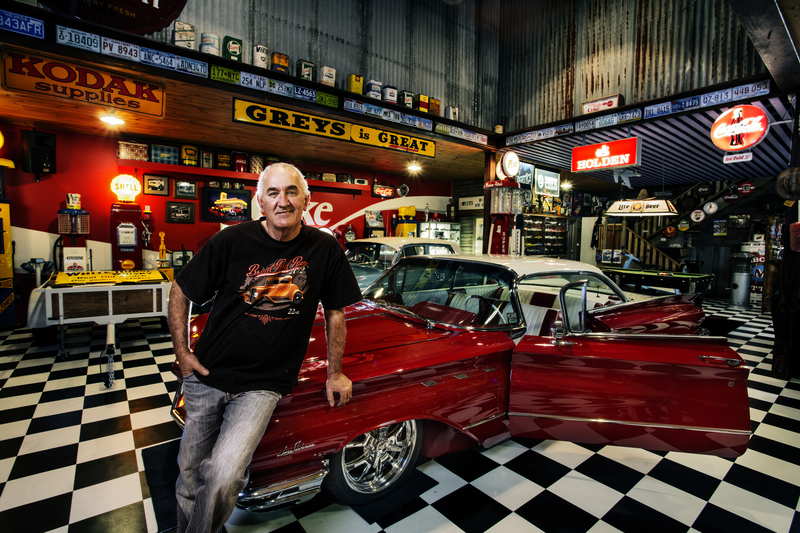 Craig Wetjen custom-built his shed to accommodate a photography studio and chill out zone. Craig has been a photographer for over three decades, so it’s fair to say he knows a thing or two about capturing the right image. He was born and bred in the United States where, before emigrating, he was employed at NASA’s Jet Propulsion Laboratories as a photographer for the Mars Pathfinder and Cassini projects. A project that he describes as an awesome experience. Eighteen years ago he moved to Australia to teach photography and digital imaging at RMIT, Melbourne, where he was pivotal in the establishment of the first cutting-edge digital photography course. Wedding photography has been Craig’s forte for the better part of 14 years but he also specialises in portraits of families and individuals. His passion for the art form is overwhelming; however, he explains that if it wasn’t for his latest project, he may have given the camera away altogether. In his own words, his latest project aims to showcase the very private relationship between a man and his shed. A man’s shed is a place to shelter, not just from the rain but from the ups and downs of daily life. It is as much a mental as a physical hideaway. By tradition, the shed is a male preserve where a man can retreat… a sanctuary. “The idea to shoot men in their sheds came about through photographing my father-in-law in his shed after my wife kept asking me to photograph him. I really enjoyed that quiet time with my own father-in-law. I also enjoyed the fact that I could create a photograph in my own time because I am usually under instruction from the bride and groom wants,” Craig explains. As the project was beginning to take shape, Craig was diagnosed with chronic lymphocytic leukaemia. While the condition doesn’t require any treatment, the diagnosis was enough to accelerate, if not shift the focus of the project somewhat. “There were no real symptoms but I just wasn’t feeling right upstairs. And if I’m not feeling right, I can’t give my family the attention they need and that’s the most important aspect of my life. I watched on as my business slowly evaporated in front of my face. The whole photography thing was doing my head in. I think it was the fact that everyone was beginning to call themselves a photographer,” Craig continues. “The project was in motion but the direction changed slight. I wanted more of an emphasis on the mental and physical health of men. If it wasn’t for Craig doing his own mental health assessment, he wouldn’t have found out about the health issues he has to deal with for the rest of his life. “I figured that my project could be used as a platform to make men aware of the importance of speaking up or seeking medical attention because generally speaking, men don’t take an active interest in their own health and wellbeing,” Craig says. 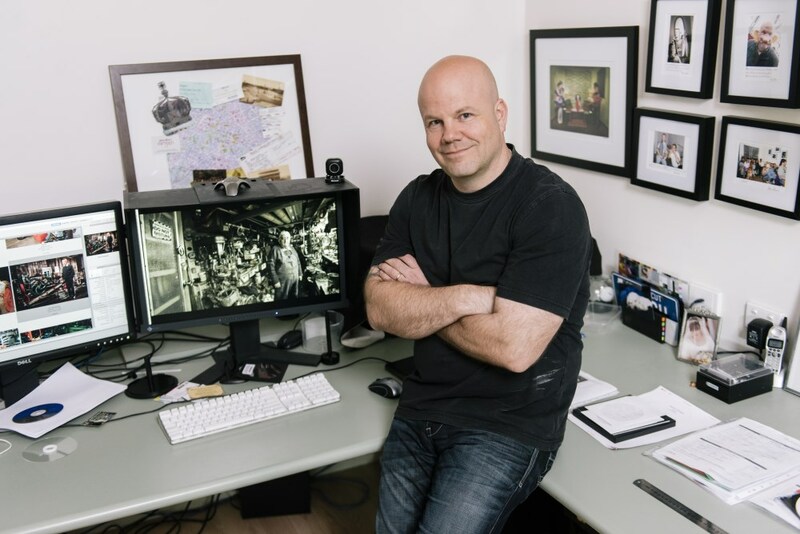 The scope for Craig’s project continually grows but his first goal is to publish a book. He’s aiming to shoot and interview 100 men across Victoria (he can only travel so far) before printing the books on demand. Christmas 2014 is the goal; however he doesn’t want to put too much pressure on himself. At the moment he’s just enjoying being out there, doing what he loves. Craig captures men in a place where they feel most comfortable – the shed. “They always say that behind every photograph is a thousand words but there’s more than a thousand words behind each and every one of the men I’ve been meeting with. Some of the stories I am collecting are just mind-blowing. And for me to be able to capture that is pretty special. It’s actually become more about the stories than the photographs. I think the biggest asset to what I do is actually listening to their stories before I get the camera out. The photography speaks more about them and who they are rather than just what they and their sheds look like. “Most of the blokes have been very open. In fact my father-in-law was one of the hardest to crack. A few have been closed off and a bit hesitant but sometimes you won’t change that, no matter what you do. I ask them what they do in their sheds and where they find they are most at peace. Sometimes I ask them point blank about their mental and physical health. Some are really forthcoming but with others it’s like opening up a rock with a can opener,” Craig laughs. As a teacher of photography, Craig explains that the most integral part of getting a photograph is by not assuming you will always get the photograph you want. As such, he teaches his students to always ‘get the person’ that they want first. “Once you succeed in doing that, the photo will come. By getting the person, you’ll end up getting the photograph. You won’t get out of somebody, what you want out of them, unless you know who you are and they know who you are. Once someone feels comfortable with you, they feel comfortable in front of the camera and they almost become mouldable like clay,” Craig explains. While the work is enjoyable, the biggest hurdle for Craig, in achieving his goal, is to come up with the required finances as the project is totally self-funded. “I have applied for a few grants but haven’t heard back from anyone yet. Last year I approached Beyond Blue for some funding which they couldn’t come to the party with but they did offer me two things that were better. Firstly, they asked my wife and I to become ambassadors and secondly, they put Jeff Kennett in front of my camera. That was a great experience as I’ve always admired Jeff. I’m still yet to know what my ambassadorial role really entails but I’m excited to find out as Beyond Blue does great things for blokes,” Craig explains. 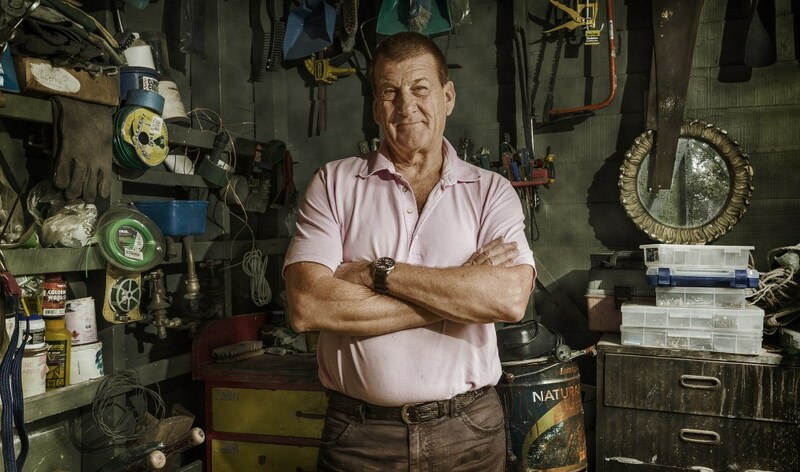 Craig admits that it was a real pleasure to have Jeff Kennett in front of his lens as he is someone that Craig has always admired. So with an avid interest in shooting men in their sheds and spaces, it makes sense that Craig spends so much time in his own. He’s been running his business out of his shed for the past six years and while a lot of work takes place in there, the lounge offers a great space for unwinding in. Comfy couches, a coffee table and a TV occupy the lounge section whereas a desk, computer screens and printers fill the office. “We built the shed in 2007 and as my wife puts it, she gave birth to her second child and I gave birth to a 6 x 6m shed,” Craig laughs. “From the outside it looks like your average shed but on the inside it’s been deck out as a lounge room and studio. It’s fully serviced and I basically built it myself. I always envisioned that this is where my business would be. I also love the fact that it tells people who I am. Like an artist, a photographer develops their own style and can impart their own look and feel to their work. 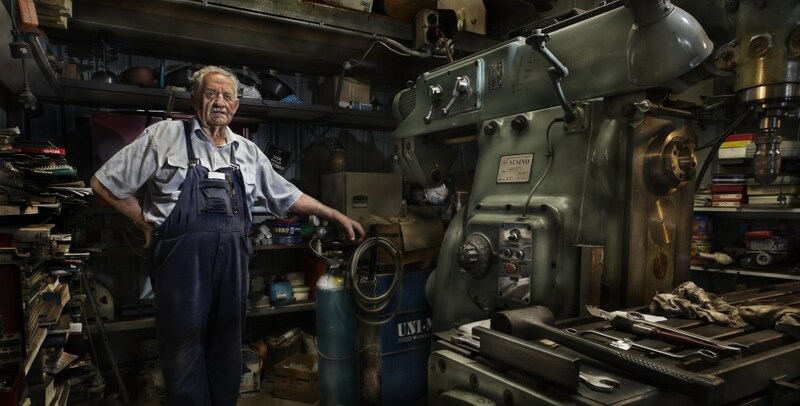 Once you become familiar with his photography and take a good look at the men in their sheds, you’ll instantly begin to recognise a Craig Wetjen photograph when you see one. The spaces are raw and so are the men. He doesn’t ask them to tidy their sheds up before he arrives and he doesn’t ask them to be anything that they’re not and that’s a beautiful thing. “This is the most fulfilling photography project I’ve ever undertaken and I think it’s because I’m not taking this time… I’m actually giving back.,” Craig explains. “It has provided me with the most gratification and for that reason alone I think there needs to be more giving back. I have made a career out of photography for years but now I can really appreciate what I do. I’m also finding more of a connection with the men I am photographing.